Before you visit Hampton Court, you might want to watch an episode or two of the HBO series The Tudors. After your visit, you’re going to want to watch the entire series. More than any other place I visited in London and the vicinity, Hampton Court Palace sparked my interest in the history of the British Monarchy. And one of the most fascinating periods of that history took place during the reign of the Tudors. The most famous of the Tudors was Henry VIII, the king who went through one wife after another in his quest for a male child, and in the process, tore England’s church away from its Roman roots, declaring himself as its ultimate authority. Hampton Court Palace was Henry VIII’s home-away-from-home — just a boat ride on the River Thames away from London. Originally, it belonged to Cardinal Thomas Wolsey, who built much of the palace, but eventually gave the property to Henry VIII. Wolsey’s career took a rather serious turn for the worse, when he failed to secure an annulment of Henry VIII’s marriage to Catherine of Aragon (the king’s first wife, of six). The divorce issue was one of many that caused friction between Henry and the Catholic Church. The King didn’t like decisions affecting England being made in Rome, and eventually, he pulled the English church away from the Pope, declaring himself as its supreme head. Okay, that’s all for the history lesson, at least for the moment. Instead, I’d rather tell you about what you can expect to see and do at Hampton Court Palace. I arrived at Hampton Court Palace too late in the day to see everything. Truth was, I probably only had a couple of hours to explore, before visiting hours were over for the day. I had to move fast. (I’ll talk more about how to get here, in just a moment). Admission to Hampton Court Palace is £15.95 for adults, £8 for children 5-16. There are discounts for seniors and students, and family tickets are available. If you have a London Pass, admission is free. You can also purchase a ticket to just the Maze or the Gardens. Opening times and updated prices can be found here. Hampton Court’s famous maze has been around since the late 1600’s, when it was planted for King William III and Mary II. It’s rather simple, even though it contains a half-mile of paths, crammed into 1/3 of an acre of land. It only took me a few minutes to find my way into the center of the maze, where a marker provides a photo opportunity. A shortcut allows you to exit without taking the long way around again. The northern gardens are known as the “Wilderness” — not because they are wild, but because they provide a place to wander. There are more than 1 million bulbs planted here. Instead of wandering around the Wilderness, I quickly headed back to where I came from — the West Front. But I didn’t forget to stop and smell the roses. Hampton Court’s Rose Garden is located just north of the main entrance to the palace at the West Front. There are rows and rows of huge rose bushes planted here, and it’s quite fragrant. Once I was back at the entrance, I headed inside. Hampton Court Palace has three courtyards. The first is Base Court. The rooms that surround this courtyard were intended by Cardinal Wolsey to be used by guests of the Palace. The fountain in this picture is a re-creation of Henry VIII’s original wine fountain — which would flow with wine instead of water on special occasions. … to see Henry VIII’s astronomical clock. 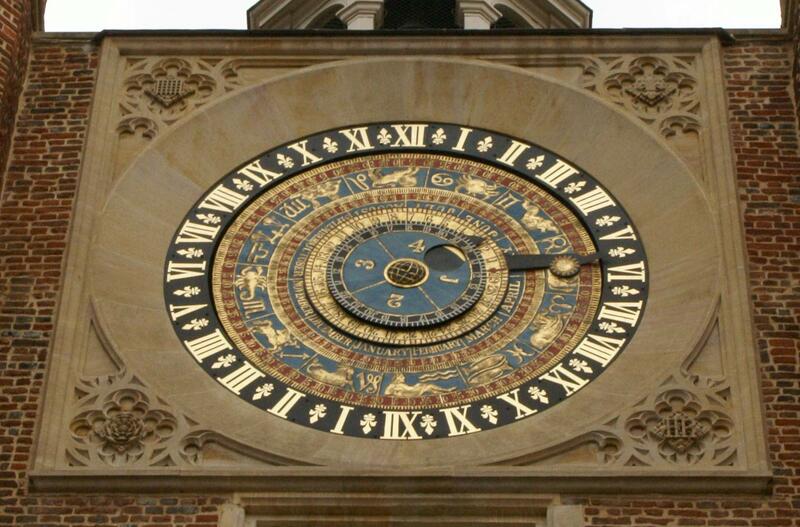 It was installed in 1540, making it one of the oldest clocks in Europe. The face displays the time (in 24-hour format), month, day of the month, position of the sun on the zodiac, phase of the moon, and the time at which the moon would cause the highest tide at London Bridge. The first part of the tour of Henry VIII’s Apartments takes you through the Great Hall. This grand room was completed in 1535, and was the last great hall built for the English Monarchy. It’s the place where Henry VIII would hold formal dinners. The king’s splendid tapestries are still hung upon its walls. In the following room, the Great Watching Chamber, the ceiling is the main attraction. It’s covered with gold leaf, and the family arms and badge of Jane Seymour, Henry’s third wife. Next is the Processional Gallery, which leads from the Great Watching Chamber to the Chapel Royal. Henry VIII would have walked this corridor, wearing his crown and finest robes, on his way to the Chapel. As you walk in the footsteps of Henry, it almost feels like he’s standing there, watching you — thanks to this famous portrait of the King, which hangs on the wall. A portrait of his son, Edward, is nearby. The boy stands in a pose similar to his father. Edward became King upon Henry’s death in 1547, when he was only 9 years old. He died when he was 15. This family portrait was painted when Henry was married to Catherine Parr, his sixth wife, but she isn’t the woman standing next to Henry. Instead, Jane Seymour, mother of Edward, stands in her place. This gathering would have been impossible in real life, since Jane Seymour died shortly after Edward’s birth. Elizabeth I is also pictured here. She was the daughter of Henry VIII and Anne Boleyn, Henry’s second wife. The portrait is intended to indicate her availability for marriage, and fertility. At the end of the tour of Henry VIII’s apartments, you’ll find the Queen’s Staircase, elaborately decorated with huge paintings. Next, I headed into the apartments of Queen Mary II. First is her Audience Chamber, which served as her receiving room, where she would meet guests. The room was finished in 1715, with the chandelier added in 1736. The Flemish tapestry depicts Christ’s charge to St. Peter. The Queen’s Drawing Room is at the center of the palace’s east front. It was used for social receptions, but it was not used until after Queen Anne’s death. Windows here look directly out towards the Long Water and the Great Fountain Garden. But who needs to look outside, when you can just look up! The painting on the ceiling is remarkable. The Queen’s State Bedchamber is next. It was completed in 1715 for George and Caroline, the Prince and Princess of Wales, and Caroline continued to use it after becoming Queen. The bed, by the way, is original. Unfortunately, you’re not allowed to roll around on it like you’re at the Sealy store. Of course, there’s another exquisite painting upon the ceiling, which depicts daybreak. The final room on the tour of Queen Mary II’s Apartments is the Queen’s Gallery. It connects the Queen’s Apartments with her closet, and the King’s Apartments. The Gallery looks the same as it did in the 1730’s — it was redecorated by King William, after Mary’s death. The stools around the perimeter of the room are originals, dating back to 1737. The tapestries, which depict the life of Alexander the Great, were added around that same time. Notice how one of them covers a doorway, and folds back when the door is opened. Remember earlier, when I told you there were three courts at Hampton Court? The first two were Base Court and Clock Court. If you kept heading east, you would reach the third one: Fountain Court. As the name suggests, there is a fountain in the center, surrounded by grass. The apartments that surround the court include Henry VIII’s, Mary’s, and William’s. Unfortunately, I wasn’t allowed to take pictures inside Chapel Royal. You’ll just have to visit it, and see it for yourself. Construction on the Chapel was begun by Cardinal Wolsey, and completed by Henry VIII. When Henry attended services, he would have sat on the upper level, or balcony, while the congregation sat below. Upon the death of Jane Seymour, Chapel Royal’s ornate features were draped with black cloth. By some accounts, her heart was buried under the Chapel’s altar. Visiting Hampton Court Palace on a Sunday? You can attend church services in Chapel Royal. There are other services during the week, as well, and there are times when the chapel is closed to visitors. Check out the Hampton Court Palace page for more info. … and as the name suggests, there’s a big fountain at the middle of it all. Go a bit further east from the fountain, and you reach the Long Water — a canal that stretches out eastward. It was added during the reign of Charles II in 1662. Stretching south from Hampton Court Palace, the Privy Garden is a sunken garden that’s one of the most beautiful spots on the palace grounds. It has been painstakingly restored to its original appearance in 1702, when it was designed for William III. Even further back, all the way to Henry VIII’s days, this was the private garden of the King. It was possible to accurately restore the Privy Garden, because of the extensive documentation of the garden’s original features. Gardeners were worried that, with the passing of William III (before the garden was complete), that they wouldn’t be paid for their work — so they took extra care to document every bit of work. … covering a pathway that runs the length of the Privy Garden. Don’t be confused — this is not the “Great Vine”… even though it is very great, and is covered with vines. … which are closed to the public, but still quite beautiful. Back in the time of Henry VIII, the ponds in the Pond Gardens were used freshwater fish, before they were caught, cooked, and eaten by the King. The ponds were filled and landscaped during the reign of William III. The famous (and world-record-holding) Great Vine is located at the western end of the south side of Hampton Court Palace. It isn’t very photogenic, but it’s impressive nonetheless. This vine was planted in 1768, which makes it older than the United States of America. Guinness recognized it as the oldest productive grape vine in the world. The base of its trunk measures 12 feet around. The vine grows inside a greenhouse, though its roots are planted outside. There is a large barren area, just outside the greenhouse, where no other plants are grown — so that all the nutrition goes to the Great Vine. The Great Vine blossoms in May, and is harvested in September. If you visit during the harvest, you can buy a bunch of grapes to eat. Even though the Great Vine is located very near the West Front entrance, it’s a dead-end. To get out, you’ll need to walk back towards the eastern side of the complex, go inside, and wander around a bit. I had to ask for directions, since by this point, I was completely lost. There are two ways to get to and from Hampton Court Palace, and I gave both a try. On the trip from London to Hampton Court, I took the Underground District (green) line to Richmond, then transferred to the R68 bus, which runs from Richmond to Hampton Court. This route wasn’t ideal, since I had a long wait for the bus outside the Richmond rail station, and the bus ride itself was quite slow (it’s only about 6 miles, but seemed much longer). For the ride back, I walked to the Hampton Court Rail Station, which is just across the River Thames from the Palace. From here, heavy-rail trains run to London Waterloo, leaving every half-hour or so, and taking 37 minutes to reach the city. Since the train is a lot more pleasant than a bus, and since the station is within a 5-minute walk of the Palace, you would be wise to take the train in both directions (unless you just want to enjoy a scenic bus ride through the suburbs). If you have a TravelCard, either of these routes are free, since the TravelCard covers Tube and Bus travel, as well as Rail travel within certain zones around London. The train station is on the edge of the town of East Molesey, in the county of Surrey. It looked like it was worthy of some exploration, but I was too tired to think of seeing anything else.